The decision of Nauru to bring to an end its relationship with Australia’s High Court, as the ultimate appeals authority for a limited class of cases, marks the end of a 50 year history in which Nauru made strenuous efforts to have access to the Court, only to suffer tepid and lukewarm acceptance, and delays (and on one occasion, defeat) in achieving its aim of having access to an appeals court of sufficient stature to instil confidence in the judicial proceedings of a small, fledgling nation. The ten year history of negotiations for an appeals court is detailed in a series of volumes held in the National Archives of Australia. This history is drawn from that rich vein of material. After years of trusteeship, in which Australia, New Zealand and Britain had access to the rich phosphate material contained on Nauru, the 7000 strong population would be granted independence, in return for continuing access by the great powers to the phosphate. Other proposals, particularly resettlement on one of a number of islands off Queensland’s coast, notably Fraser Island, had been considered but rejected by the proud Nauruan population, led by its Chief (and later first President), Hammer DeRoburt. Independence meant establishing institutions of governance capable of being populated by the island’s people, and then having access to external sources, where resources were strained or non-existent, as in the areas of defence and external affairs. Nauru also turned its attention to what was needed to have a capable and authoritative judicial system. On 31 January 1968, Nauru gained independence from Australia. But even before this was achieved, the possibility of the High Court remaining the final avenue of appeal for Nauruans formed the basis of negotiations. Under article 49 of its constitution, Nauru would have a Supreme Court as a superior court of record. As Peter MacSporran notes in his book on Nauru’s constitution, this is interesting because courts are usually graded by the taxonomy of supreme, superior and inferior. By nominating its Supreme Court as a superior court, it left the door open for a higher court to which appeals could be made. The constitution, by article 57, dealt with appeals from the Supreme Court, with specific provision for appeals being made to the court of another jurisdiction or country. The Government of Australia shall make provision for the hearing of appeals from the Supreme Court of Nauru in accordance with conditions to be determined by the two Governments. 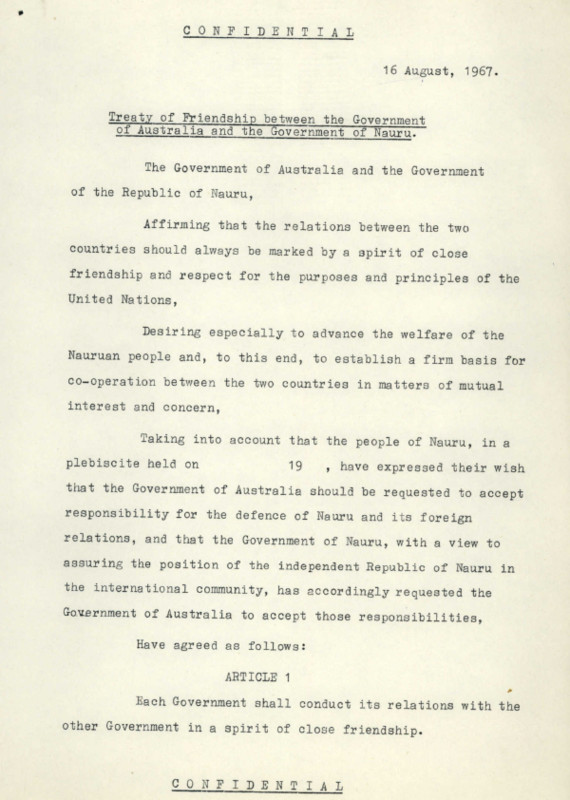 While the Australian Government had hoped that a Treaty of Friendship would cover many of the aspects of the bilateral relationship, no treaty was concluded prior to Nauru gaining independence. Thereafter, much of the energy towards an appeals role for Australia fell to Nauru. 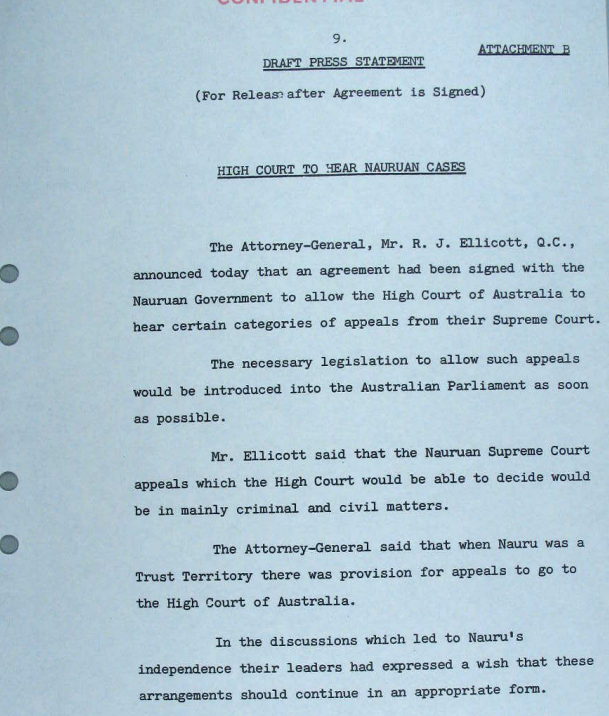 The files show repeated entreaties from the Nauruan President and the Chief Justice to Australian representatives, both in person and by correspondence. The eagerness of the Nauruans for such access was formally explained by the fact that, in all likelihood, the Supreme Court would be constituted of one justice, and likely to be one of comparative less seniority and experience than those holding similar positions in Australia and New Zealand. Confidence in Nauruan judicial administration would be reinforced by access to an appeals court accorded broad recognition and respect. From its outset, independent Nauru appreciated that the phosphate fortunes that had previously gone to Australia, New Zealand and Britain, and now flowing to itself, would in all likelihood be exhausted by end of the century. It set up a Trust fund for investment of the fortunes, which made property investments in Australia and elsewhere, and established an airline, Air Nauru (whose planes had to account for the tight confines of the island to achieve take off before the runway ran out), and in the 1980s, undertook failed investments in such projects as a West End musical, Leonardo, based on the life of da Vinci. But Nauru needed to find other economic activity to generate income. Early in its life, it hoped that it could become to the Pacific what the newly self governing islands of the West Indies was to the northern hemisphere: a tax haven and home to bank accounts which did not want to attract the prying eyes of authorities. The existence of these West Indies enterprises, buttressed by its access to the Privy Council in the United Kingdom, reinforced Nauru’s belief it needed access to a respected appeals authority if it too were to succeed in such ventures. Even basic shipping and commercial activities were thought to warrant the confidence access to an appeals court would bring. While the appeals provision would be available for criminal and civil matters, it was never intended for the High Court to hear appeals on constitutional matters or disputes over title to land, with these reserved to Nauru’s Supreme Court as the ultimate arbiter. Speculation sidebar: I have no way of proving any of the following was ever a factor, but I find the possibility tantalising. Among the issues facing the new nation of Nauru was the physical future of the island. The phosphate mining that had dominated the island for most of the twentieth century had all but devastated the centre of the island, leaving a coastal ring for habitation. Rehabilitation was a paramount concern in the settlement arrangements for independence, but little had been set aside to repair the island. Before his reputation became fixed in many people’s minds as a result of his role in the dismissal of the Whitlam Government, as an adviser to the Governor-General, Sir John Kerr, and his decisions on tax matters, and before his elevation to the court, the Chief Justice of Australia’s High Court, Sir Garfield Barwick, had somewhat of a reputation as a small-l liberal and reforming Minister in his capacities as External Affairs Minister and Attorney-General. At the time of the negotiations, and for a long period thereafter, Sir Garfield was President of the Australian Conservation Foundation, which he had helped set up with the assistance of others involved in a nascent environmental movement. 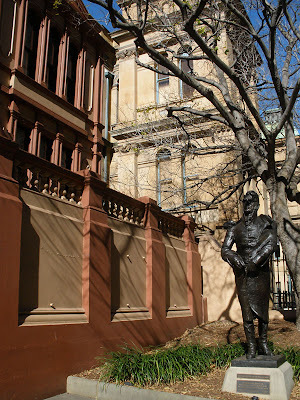 Interestingly, this movement shared many links with the conservative side of politics, as the issue was seen as a way of preserving Australia’s natural heritage. During the course of the Nauru appeals negotiations in the late 60s and early 70s, notwithstanding his role as Chief Justice, Barwick was an active President, for instance, campaigning on such issues as the preservation of the Great Barrier Reef and opposing the extension of mining into national parks in NSW. I think it possible that Chief DeRoburt, or his advisers, saw an environmental ally in Barwick and his court should any of the rehabilitation questions or similar matters come before the High Court. While there were many players in the negotiations that would extend over nearly a decade before coming to fruition, two stand out: Ian Thompson, in Nauru, and Ewart Smith, in Canberra. But other luminaries brought their efforts to bear, including Dennis Rose, later to be Chief General Counsel for the Commonwealth, and on occasion, acting Solicitor-General. The first Chief Justice, Justice Knox-Mawer who sat as a judge in Fiji, came and went without hearing a single matter. The second Chief Justice, Ian Thompson was a soldier turned barrister, who had served as a magistrate in Kenya in its incarnation as a British outpost, and had been a judicial officer in Fiji. Later appointed to the Administrative Appeals Tribunal in Australia, he was promoted to Deputy President. He was praised by Canberra Times editor and journalist Jack Waterford as a first-rate deputy president. It would be Thompson who, on behalf of Nauru, would pursue the matter of the High Court’s involvement for years. The second intervention came in Ewart Smith’s post-career life, when, in 1987, he single handedly brought about the end of the Hawke Government’s “Australia Card” identity card proposal. Smith had established that, notwithstanding a double dissolution and the potential joint sitting, the government’s legislation relied too heavily for introduction by way of regulation, which could be disallowed by a hostile Senate acting alone. Faced with this knowledge, the Hawke Government shelved the proposal and moved to greater use of the tax file number for addressing the shortcomings of Australia’s tax collection system. Without an agreement in place by independence in 1968, Nauru looked to Fiji for assistance for peopling the Supreme Court, in the form of Justice Knox-Mawer. However, with its small population, and nascent nation status, it appears Knox-Mawer was never called on to decide a matter in the Supreme Court of Nauru. the procedures to provide the appeal could be framed as to take advantage of both section 122 and section 51. Through much of this period, officials in Australia were hopeful that the appeals provision might be founded in a Treaty with Nauru, as foreshadowed in the 1967 draft, strengthening the call on the external affairs power. But Nauru was dragging its heels on the treaty question as slowly as Australia was on the appeals issue. Another proposal, but one rejected out of hand by Nauru’s president was to have an appeals court peopled by the High Court’s justices as personae designata, where the justices would not hear matters as the High Court of Australia, but be designated to constitute an appeals court of Nauru. DeRoburt rejected this out of hand: it would be access to Australia’s High Court or nothing. 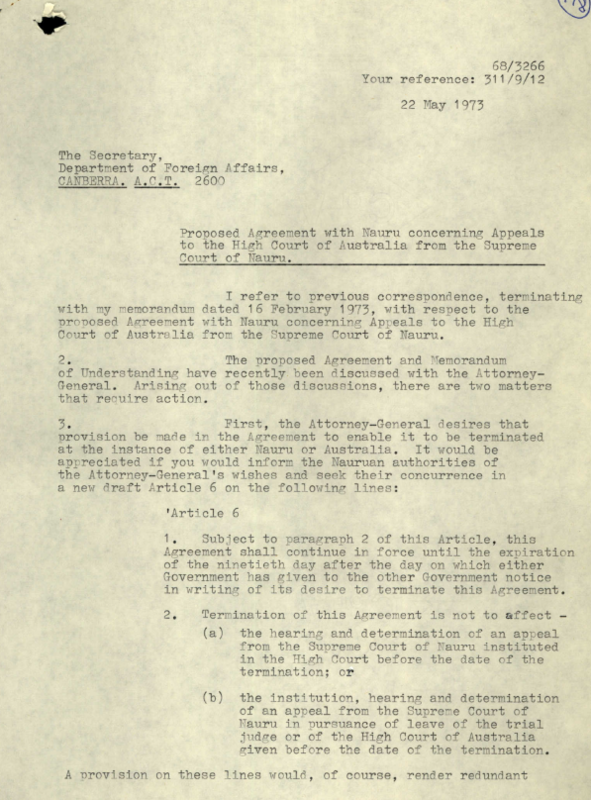 Advancing the matter to a mutually agreed conclusion in the immediate period after Nauru gained independence was not helped by the changes in Attorneys-General, and the relative instability of the Coalition Government, with the death of Harold Holt, and the removal of John Gorton in this period causing reshuffles and changes. There were four Attorneys-General between 1968 and 1972, with Nigel Bowen (twice), Tom Hughes and Ivor Greenwood holding the post at various times. During Hughes’ time as Attorney-General, the views of the Chief Justice, Barwick, were sought. 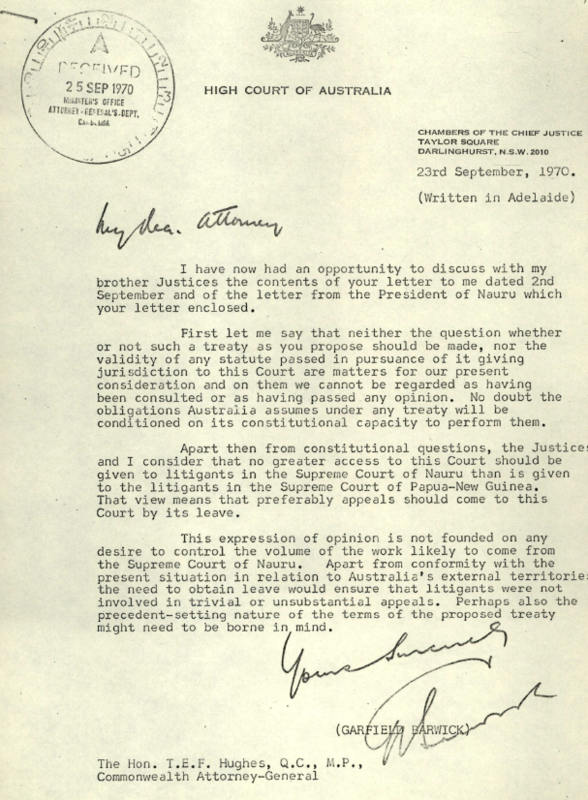 In September 1970 Barwick advised that while he wouldn’t comment on whether the matter should be pursued, or the validity of its foundations in the Constitution, he believed any arrangement should not provide litigants in Nauru any more access to the High Court than was afforded to litigants in Papua New Guinea, then administered by Australia. This meant that Nauruan litigants would need leave to appeal from the High Court. Barwick advised this was not so much to limit the number of matters from Nauru, but rather to ensure that trivial or unsubstantial matters were not advanced before it. While negotiations continued, there was still no resolution by the time of the coalition government’s defeat in December 1972. The election of the Whitlam Government, and the appointment of Lionel Murphy, brought new wrinkles to the issue. Wanting to change direction on Australia’s foreign policy, particularly in relation to the consequences of colonialism, Murphy felt uncomfortable about providing a new form of oversight over Nauru from the High Court. There were also issues with Nauru’s retention of the death penalty, which the Whitlam Government wanted to formally abolish with respect to Australia. Similarly, the Government’s intention to limit appeals to the Privy Council jarred with establishing a remote court of appeal for a foreign nation within Australia’s judicial branch. In late 1974, Murphy put a submission to Cabinet that legislation be prepared for putting the appeals arrangement into place. However, for reasons not clear, the submission was withdrawn over the summer of 1974-75. 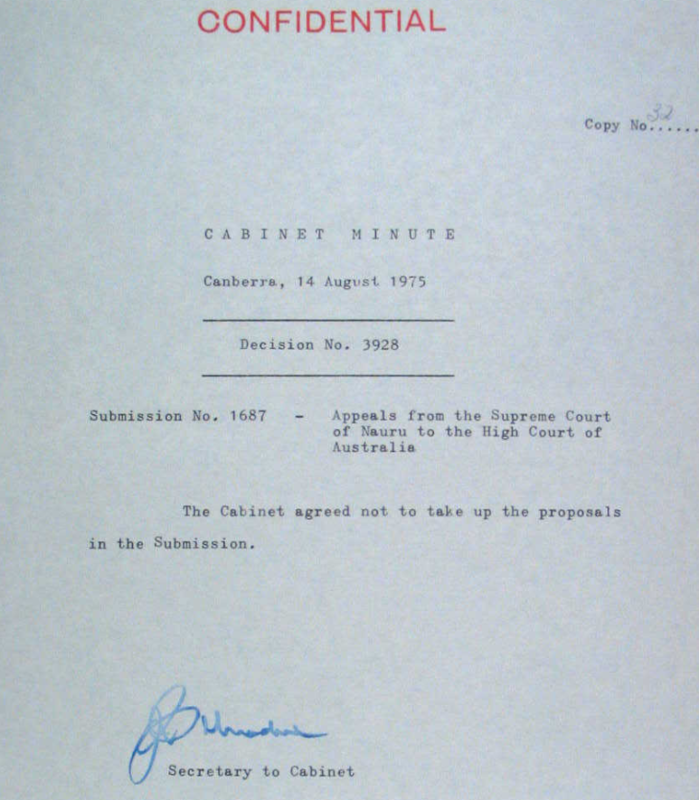 In August 1975, Kep Enderby, Lionel Murphy’s successor as Attorney-General, put forward a submission in the same terms as Murphy’s 1974 submission. In a surprising decision, given all the negotiations that had led up to that point, Cabinet resolved not to proceed with the appeals option. 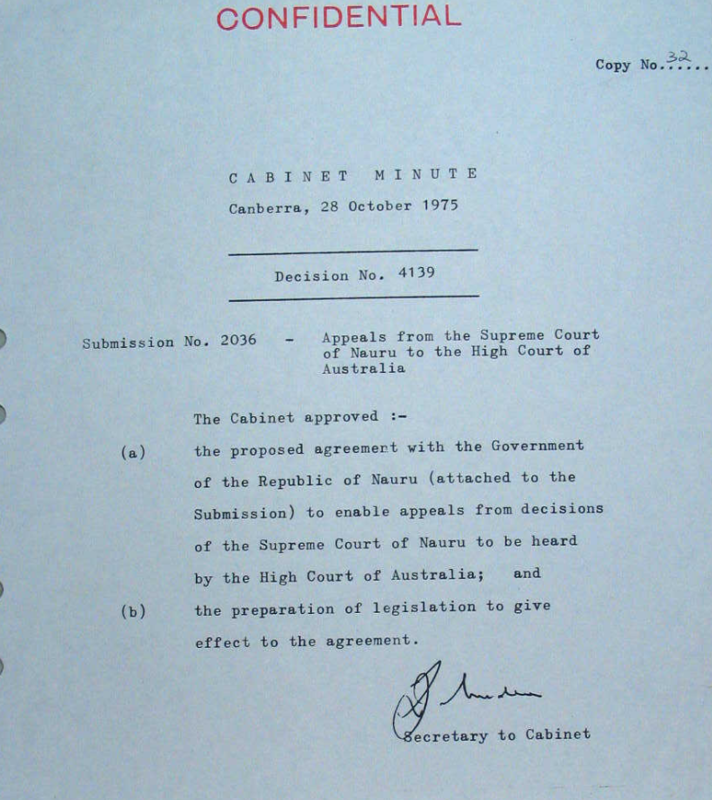 From other records, notably the submission put up for consideration two months later, it appears that Cabinet’s concerns were the apparent similarity to Australia’s access to the Privy Council, which Whitlam wanted to wind back, and that it would raise a precedent for the newly independent Papua New Guinea. Two months later, in a change of approach, Don Willesee, the Foreign Affairs minister, put the matter up for reconsideration. His submission argued that Australia’s relationship with Nauru would be adversely affected if the appeals option was not approved. Willesee argued that the arrangement was at the initiative of the Nauruans. He emphasised the relative ease with which the arrangement could be terminated, by way of the 90 days notice provision, which could be exercised by either nation. He argued the issue with PNG was not relevant as it had not sought any such arrangement. Interestingly, Willesee had visited Nauru as Foreign Affairs minister in January-February 1973, where he had been lobbied on the appeal court issue. In the official report on his return to Australia, along with acknowledging Nauru’s hospitality (“One principle remained clear (through the alcoholic haze): if you dine with President DeRoburt and his cabinet you need first to brush up your Australian ballads as well as your vocal chords“), Willesee had emphasised the perceived improvement in relations over that which had developed in the last years of the Coalition government. Approval of the proposed agreement would accord with the Government’s policy of seeking to be a helpful neighbour in the South Pacific. The proposed agreement can be regarded as a non-traditional form of aid to a neighbouring mini-state which was formerly administered by Australia, and as providing a useful legal service to a nation which lacks expertise in most technical and professional areas. This time the proposal found favour in Cabinet, but with the dismissal of the Whitlam Government two weeks later, it advanced no further under a Labor administration. While negotiations progressed, the question of how either of the parties would bring an end to the arrangements was raised. Australia thought that it would be Nauru who would require this provision, given it would be happy to continue the arrangement for so long as Nauru wanted it. The first approach was that the appeal “treaty” would rely on Article 56 of the Vienna Convention on the the Law of Treaties, which enables parties to withdraw from a treaty with a year’s notice, provided there is an intention of the parties to permit withdrawal and the possibility of withdrawal is implied in the treaty. As neither Australia nor Nauru anticipated that withdrawal would be an issue in the foreseeable future, doubts might be cast on whether the requirement that the possibility of withdrawal be implicit in the treaty would be met. Smith however conceded that it was hardly in Australia’s interests to continue an Agreement if Nauru wanted it to be terminated. He proposed that instead of relying on Article 56, that Australia and Nauru enter into an agreement that if either party wanted to withdraw, that this could be effected if Nauru gave reasonable notice and that the request for termination not affect any pending appeals before the High Court. “Reasonable notice” was not given a definite timeframe at this juncture. 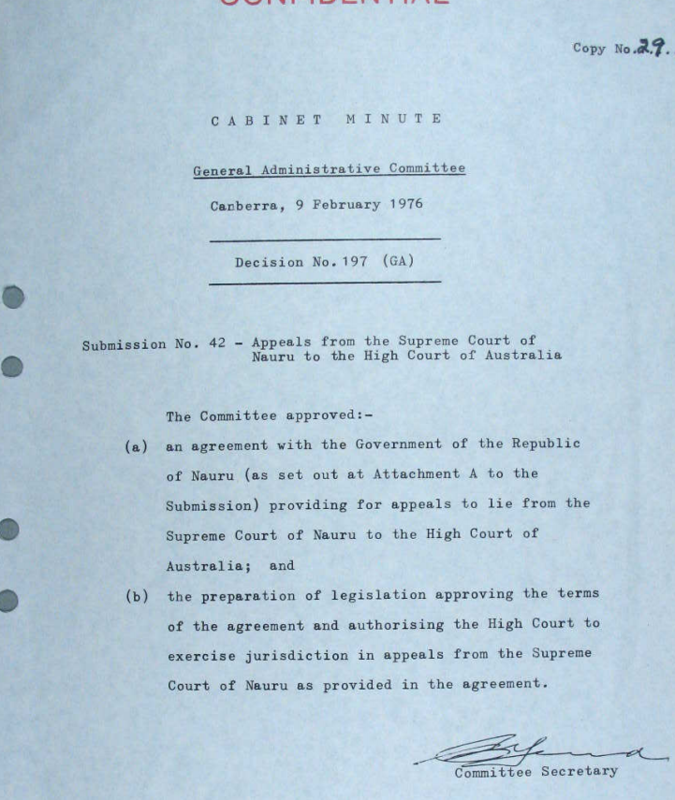 In May 1973, Lionel Murphy indicated that if the proposal were to be adopted he wanted an article in the proposed agreement to address the termination question, allowing it to be terminated at the instance of either Australia or Nauru. This advice contained the first reference to 90 days being the time-frame for which notice would be required. Looking at the archive records, 90 days was not a particularly short or long time in which notice had to be given. The records show periods of months before even the most basic correspondence on the issue received attention and response. There are instances of replies being sent by mail and crossing other mail raising or advancing the same issues. There are few instances of the matter being progressed by the speedier transmission of telex and telegram. The formal consideration of termination would need all of the 90 days for even the most basic communications to be undertaken and advanced. By 1976, nine years had passed, and the issues of an appeals court for Nauru had not been settled. It fell to new Attorney-General, Bob Ellicott, to advance the matter. Within weeks of the newly elected Fraser Government taking office after the December elections of 1975, Ellicott returned to the unfinished business of the previous governments, and pressed for Cabinet adoption of the Nauru-Australia agreement, couched in the same terms as the iteration in the Enderby submission of October 1975. 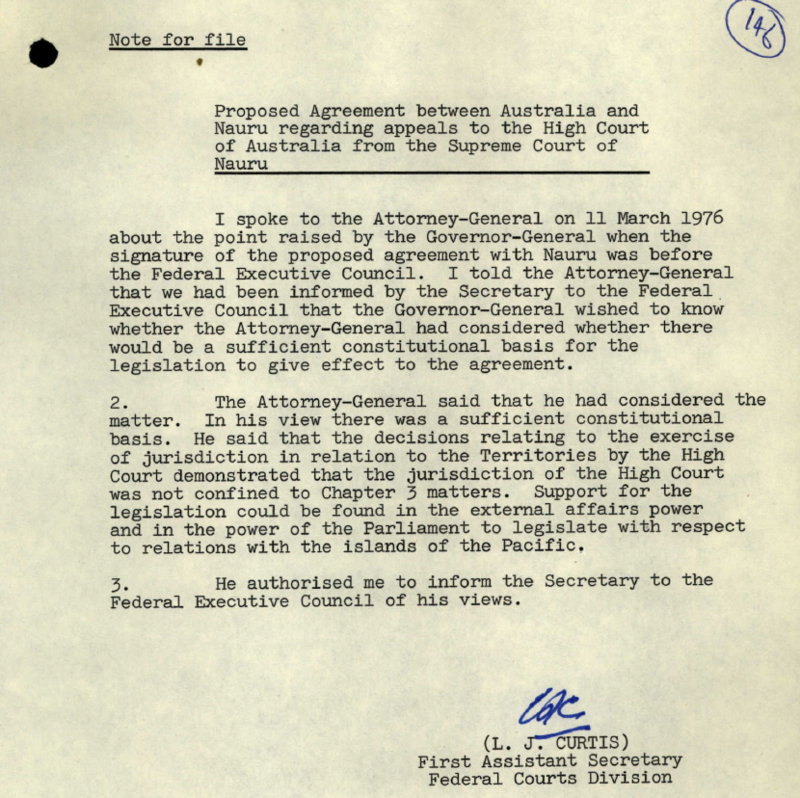 When the Agreement that would underpin the appeals arrangements was presented to the Governor-General, Sir John Kerr, for signature in March 1976, he demurred, wanting reassurance on the constitutional validity of any arrangements to give effect to the Agreement. This assurance was subsequently provided, indicating that the Agreement was supported by the external affairs and Pacific islands relations legislative heads of power. The minute was duly signed. Australian legislation to give effect to the arrangements was introduced in the form of the Nauru (High Court Appeals) Bill 1976, on 7 October 1976. (Nauru had passed complementary legislation in 1974). The Bill passed both houses, was assented to on 9 December 1976, and commenced operation on 21 March 1977 – nearly ten years, after the first tentative beginnings were wrought. Despite the strenuous efforts of parties in Australia and Nauru to establish the High Court as the ultimate appeals court for Nauru, matters referred to it were few and far between from the commencement of the Appeals Act and the time that Nauru became part of the “Pacific solution” to dealing with irregular asylum seekers. Up to 2001, only two matters had been removed to the High Court for appeal. The constitutional validity of the legislation, that had exercised Sir John Kerr and Ewart Smith, among others, would come under scrutiny in the matter of Ruhani v Director of Police  HCA 42. While the Commonwealth did not seek to be a party to defend the validity of the Appeals Act, the Court upheld the lawfulness of its jurisdiction over Nauru by a 5-2 majority. In recent years, with asylum seekers sent to a regional processing centre on Nauru, the number of matters appealed to the High Court from Nauru, became more numerous. Faced with the prospect of the High Court ruling on more politically charged cases, the Nauruan government made use of the termination provision in December 2017, thus bringing an end to the High Court’s jurisdiction as an appeals court, save for those matters already before it, in March 2018. Done with no fanfare and publicity, until the 90 days had expired, the Nauruan government’s decision has seemingly brought to an end the fifty year history of the efforts to accord an external appellate court for Nauru. Next postMP travel claims and elections: Were the rules broken or stretched?